Thanks to Universal Salt Iodization, Armenia has recovered from historic iodine deficiency to sustain ten years of healthy iodine nutrition. The medical and public health community of Armenia has new cause to celebrate. Recent research findings showed that Armenia is protected from iodine deficiency disorders (IDD), a leading cause of cognitive impairment in newborns. This news is a victory for Armenia, a small middle-income country of 2.8 million that has come a long way in the past decade from historic struggles with malnutrition including stunting and wasting along with micronutrient deficiency. Now the country faces a ‘double burden’ – that is, deficiencies in micronutrients on the one hand but a surplus of calories on the other, leading to stunting among children, and obesity and cardiovascular disease in adults. We tested iodine nutrition in the populations most affected by deficiency – school age children, women of childbearing age, and pregnant women – and found that all had sufficient iodine nutrition. Armenia was identified as iodine deficient as recently as twenty years ago, and this most recent finding marks more than ten years of iodine sufficiency. This sustained progress is a direct result and a ringing endorsement of the national Universal Salt Iodization (USI) program, which entails iodization and monitoring of local salt production, as well as enforcement of iodization for imported salt. Dr Sisak Baghdasaryan, a research assistant in the Armenian study, is seen here collecting and later preparing urine samples for laboratory analysis of iodine levels. The analysis showed that school-age children are iodine sufficient. We can now say conclusively that iodine deficiency is no longer holding back the human potential or development of the country. This finding allows Armenia to shift the focus to sustainability, and to identifying and addressing other hidden hunger and nutrition problems, such as anemia and Neural Tube Defects (NTD) due to deficiency of dietary folic acid. One of the main reasons why the salt iodization program was so successful in Armenia (as well as in many other countries of South Caucasus, Eastern Europe and Central Asia) is that it was based on decades of effective salt iodization efforts in the USSR as well as in former Yugoslavia, Bulgaria, and Romania, dating back to the mid-1950s. Salt iodization collapsed in 1990 with the dissolution of the socialist economy. It was resumed a decade later in Armenia with support of UNICEF and other international donor agencies. However, it was Avan salt factory near Yerevan that commenced iodization of all salt for human consumption even before the adoption of government decree on USI. The salt industry has played a fundamental role in reaching optimum iodine nutrition in Armenia over past two decades. "The success of the USI program can now serve as a model for programs to combat other micronutrient deficiencies. Vitamin A, folate and iron are other micronutrients critical for population health." We stress that while the latest results are positive, they represent one snapshot in time. It will be critical to monitor and understand the iodine situation on an on-going basis, ideally using existing systems – using the universal neonatal thyroid screening program is a promising way to do this. And the success of the USI program can now serve as a model for programs to combat other micronutrient deficiencies. Vitamin A, folate and iron are other micronutrients critical for population health. Investigating these and other micronutrients that may be lacking in the population would be the first step. In our conversations with policymakers and clinicians we were reminded of the importance of communication between the two – to ensure that evidence-based policy transfers to best practice, and reaches the population through the medical community. Part of the next phase will be to reach clinicians through guidelines, workshops, and seminars for local clinicians in provincial areas. Photo taken during a visit to the Avan salt factory in Yerevan. 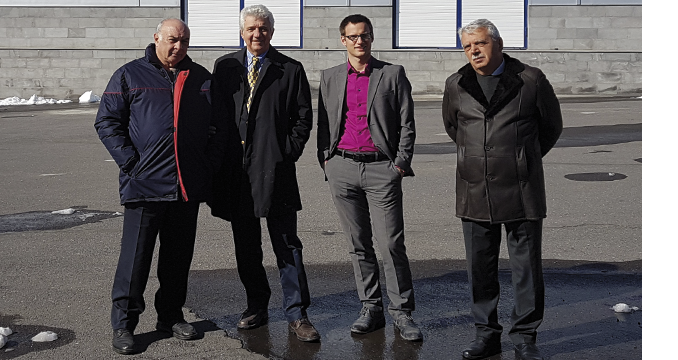 (L-R) Areg Gukasyan (President of Avan Salt); Gregory Gerasimov (IGN Regional Co-ordinator for Eastern Europe & Central Asia); Nicholas Hutchings (researcher in the Armenia study); Hrair Aslanyan (IGN National Co-ordinator for Armenia). We shared all of these insights at a meeting in Yerevan on 10th October with multi-stakeholders including representatives of Ministry of Health and of the endocrinology community, local clinicians, policy makers, and members of the scientific community. Public health programs are complex, challenging, and often stymied by ambiguous outcomes, but the USI program in Armenia has proved to be an unequivocal success. During our time in Armenia we were struck by the engagement of local clinicians and school teachers. There is a strong sense of investment in understanding the current situation in order to get the most for patients and the public in Armenia, and that cooperative spirit on the ground and in Armenia’s leadership is a huge component of why this program has been so successful. Nicholas Hutchings obtained his bachelor’s degree in History from Yale before spending a year at the Immunization Program of the Alaska Division of Public Health. He completed a Premed Post-Bac at Johns Hopkins, and then worked as a research assistant studying HIV Dementia at UCSF. He is currently a fourth-year medical student at the Columbia University College of Physicians & Surgeons.